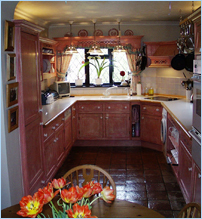 Bed and Breakfast Guildford, Surrey - Grantchester, Send. An attractive family house with large picturesque gardens. private shower room and toilet. 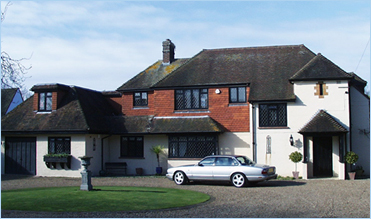 Situated between the villages of Ripley and Send approximately 5 minutes drive from Guildford and Woking town centres. Numerous local restaurants and pubs plus all the expected amenities within the towns of Guildford and Woking, including large sport centres, indoor and outdoor swimming pools, ice rinks, tenpin bowling, huge cinemas, theatres and excellent nightlife. 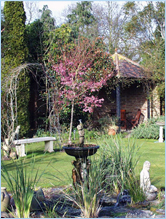 Wisley Gardens, Newlands Corner and many parks again within 5 minutes drive of our location as well as many golf courses. London is approximately 1 hour drive or 45 minutes by train as is Brighton. Large drive with ample parking. Very easy access to A3 and junction 10 M25.